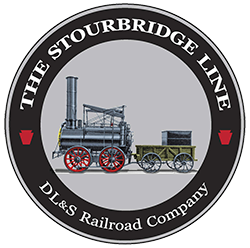 All aboard The Stourbridge Line! Scenic passenger trains through the Pocono Mountains. Experience a relaxing, scenic train excursion in vintage railroad coaches along the Lackawaxen River Valley. The Stourbridge Line offers a variety of scenic excursions and themed train rides from Presidents Day through the holiday season including the popular fall foliage season. Located 2.5 hours from New York City and Philadelphia, The Stourbridge Line is great for a family day trip or vacationing in the area. Grab your ticket and climb aboard to enjoy the history and beauty of the Northern Poconos. All aboard!